On July 1, 1769, the first European settlement on the Californian coast was established as a small, struggling Spanish colony. On this day, Governor Don Gaspar de Portola officially claimed “Alta California” as Spanish territory, and Father Junípero Serra arrived to establish what would become the first of 21 Spanish missions in the region (Mission San Diego de Alcalá). The San Diego Presidio, which was built to protect the original colonists from American Indian attack, became the military headquarters for continued Spanish exploration of the interior lands, and throughout Northern California. As the first of four presidios Spain eventually constructed in the region, it would remain a critical seat of military power throughout Spanish and Mexican rule of the territory. Spain’s second and third Californian presidios are also featured in this itinerary and can be found here: Monterey and San Francisco. Today the San Diego Presidio, a National Historic Landmark, remains a testament to California’s Spanish and Mexican foundations, and a reminder of the early struggles and victories associated with colonization. The presidio and its colony of San Diego were the birthplace of European control over the west coast. Set within Presidio Park, the San Diego Presidio is one of the city’s most beautiful and historic sites. The Junípero Serra Museum interprets the site for visitors, and it continues to be both an active archeological site and a popular tourist attraction. 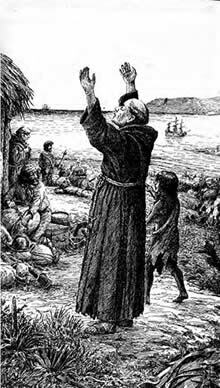 Nearly 300 Spanish colonists set out with Father Junípero Serra on an expedition to bring Christianity to the native people of Alta California. On July 1st, 1769, only 126 of the party remained and arrived at the banks of the San Diego Bay. Spanish Governor Don Caspar de Portola, who accompanied the group, officially claimed the land of Upper California for Spain and within two weeks, Father Serra had established the first Spanish mission in the new territory. The small group of colonists was vastly outnumbered by Native Americans in the area – 5,000-some tribes-people who were not universally accepting of the new European presence on their land. In August of 1769, a destructive native attack and the threat of future conflict forced the Spaniards to erect a crude stockade on Presidio Hill. Completed in 1770, the presidio protected the mission and the colony, and further represented a permanent Spanish presence on the bay. The original presidio was simply made and constructed entirely of wood. The fenced stockade included two bronze cannon and rough wooden houses with tule roofs. A central square contained the commandant’s residence, the chapel, a cemetery and various storehouses. Officers’ and soldiers’ quarters ringed two sides of the square. All told, about 100 people lived in the original presidio compound proper. While the new presidio served to protect the colonists, its construction also drained the community of its resources. By January 1770, the settlement was at the point of near starvation. Its abandonment or demise seemed imminent. On March 19, a Mexican supply ship sailed into San Diego Bay and saved the colony from certain ruin. In 1774, Father Serra moved his mission to a new site, six miles to the northeast (the San Diego Mission Church is also featured in this travel itinerary). This solidified the presidio as a predominantly military complex. Over the next years, the primitive San Diego Presidio was transformed into the center of Spanish exploration and military operations throughout California. In 1778, the rudimentary wooden stockade began to be replaced by stronger adobe buildings. By 1795, major additions to the presidio were constructed including an esplanade, powder magazine, flagpole and several adobe barracks to house an increase in soldiers living at the site. Fort Guijarros, a major armed battery with 10 additional cannon, was constructed in 1797, and the height of the presidio’s era of power began. 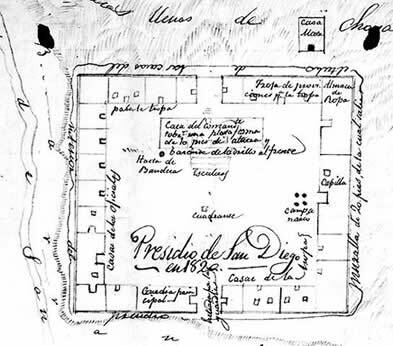 The San Diego Presidio remained the seat of military power in California throughout the rest of Spanish rule. When news of Mexico’s independence from Spain reached the complex in 1822, the Mexican army took control of the presidio, and it served as the Mexican Governor’s residence from 1825 to 1829. In 1830, new-found security in the region caused the military presence at the presidio to rapidly decline. The pueblo of San Diego was also officially founded in 1835 and many of the old presidio buildings were deconstructed in order to use their materials to expand the growing city at the base of Presidio Hill. By the end of the 1830s, the former stockade was in complete ruin. When the United States took control of San Diego in 1846, neither the presidio nor Castillo de Guijarros had any military value and they were largely abandoned to make way for new military construction elsewhere in the city. The site of the Presidio of San Diego was rescued from complete oblivion in 1929 when 37 acres of its surrounding land were donated to the city by the owner and historian George W. Marston. San Diego officially accepted this gift in 1937 and transformed the land into a formally landscaped public park. Too little of the actual presidio remained to attempt a reconstruction, however. The ruins were covered with earthworks and their outlines were indicated by a simple adobe wall. The Junípero Serra Museum was also constructed to help interpret the site, and houses a collection of important objects related to the presidio’s Spanish and Mexican heritage. Visitors to the site today can learn about the Presidio and Spanish history in the region by visiting the Junípero Serra Museum. The Junípero Serra Museum, built in 1929, remains the primary architectural feature of Presidio Park today. Most of what remains of the former San Diego Presidio now lies directly in front of the museum, though several 20th century infrastructure projects have caused the loss of sections of the site including an entire row of barrack ruins and an original wall. Visitors, however, can still view extant vestiges of the San Diego Presidio. The Junípero Serra Cross, erected in 1913 in honor of Father Serra, stands at the center of the park. It is built from the many pieces of brick and floor tile that littered the site at the time of its construction. Grass covered mounds still cover the ruins, and the outlines of former walls and basic building floor plans are evident. Archeological excavations and site research continue in an effort to better uncover and understand the extent of the site. The Junípero Serra Museum houses a large collection of archeological finds, historic objects, and reference materials related to Spanish colonization and the early heritage of California. Rotating exhibits and interactive educational programs are offered which help tie the history of the presidio itself to the greater Spanish and Mexican heritage present throughout San Diego. Presidio Park itself offers visitors the chance to explore over two miles of beautiful trails in a natural refuge within urban San Diego. The park’s dramatic landscaping features native and non-native species. The park also offers The Old Presidio Historical Trial, a self guided walking tour that begins on the corner of Juan St. and Mason St. and is marked with interpretive signage. The park directly abuts the Old Town San Diego State Historic Park, which showcases and celebrates the original location of the pueblo of San Diego and its transformation into the present metropolis. 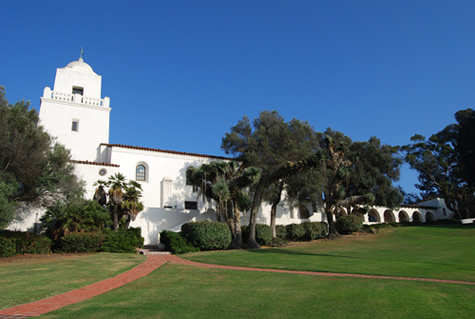 The San Diego Presidio is a National Historic Landmark and part of San Diego’s Presidio Park. The Presidio is located at 2811 Jackson St in San Diego, CA. Click here for the National Historic Landmark file: text and photos. The Junípero Serra Museum interprets the site and is open to the public on Saturdays and Sundays. For more information, visit the Junípero Serra Museum website or call 619-232-6203. The San Diego Presidio is also featured in the National Park Service Early History of the California Coast Travel Itinerary.